Day 3 of the coursing crueltyfest in Clonmel has been postponed due to heavy frost. Now the dozens of hares snatched from the wild by the coursers will be forced to spend another week in captivity before being again used as live bait for greyhounds on 8th February. 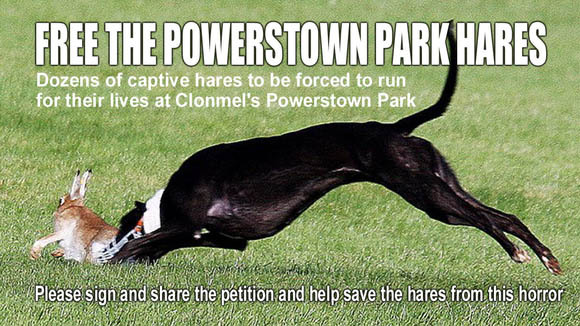 Please sign and share our new petition which calls on the government to urgently Free the Powerstown Park Hares and ban hare coursing. The petition is primarily aimed at Minister Heather Humphreys and the National Parks and Wildlife Service (who licence this barbarity). We are urging them to immediately intervene to save the hares and release them back to the wild where they belong.